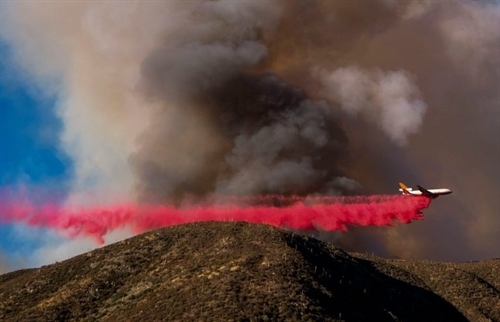 LOS ANGELES — A rapidly spreading fire raging east of Los Angeles forced the evacuation of more than 82,000 people on Tuesday as the governor of California declared a state of emergency. Governor Jerry Brown declared the state of emergency for San Bernardino County, located just 100km east of Los Angeles, where the blaze, which has been named the Blue Cut fire, was quickly growing. The fire, which began around 10:30am (1730 GMT) on Tuesday, has already burned more than 3,600ha, according to Inciweb. California is in its fifth year of a record drought and undergoing an extreme heat wave. Two firefighters were lightly injured by the blaze, which some 700 fire personnel are battling, according to Inciweb. Fire season is in full swing in California, where another fire has been burning 100 miles north of San Francisco since Saturday. The Clayton Fire, as it is called, has burned more than 4,000 acres and is being fought by around 1,700 fire personnel who have brought some 35 per cent of the blaze under control, according to the website Cal Fire.